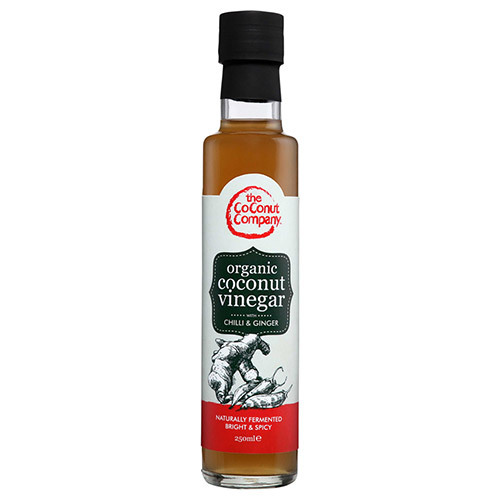 The Coconut Company Organic Coconut Vinegar - Chilli & Ginger contains vitamins B and C and an abundance of minerals and amino acids. Superior to processed vinegar. Derived from the raw sap of the coconut blossom with a kick of bird`s eye chilli and Asian ginger. This vinegar is naturally fermented for a minimum of 10 months without adulteration. 100% natural, 0% preservatives. Organic coconut sap, organic ginger, organic chilli. Below are reviews of The Coconut Company Coconut Vinegar - Chilli - 250ml by bodykind customers. If you have tried this product we'd love to hear what you think so please leave a review.